With recent flooding in our coverage area (Roswell, Las Vegas, Santa Rosa and others) and other states (Colorado, Texas and Florida) this has become a new concern. 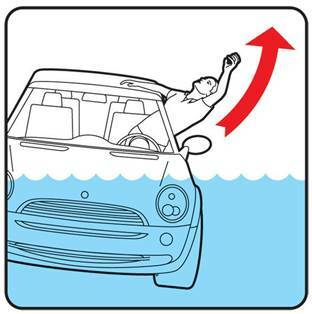 Any car accident is frightening, but an accident in which your vehicle is thrown into the water, with you trapped inside, is absolutely terrifying. 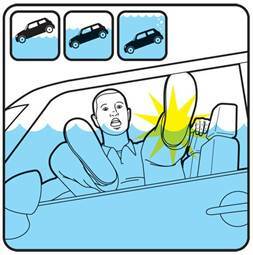 Such accidents are particularly dangerous due to the risk of drowning and in the states, 10 percent of drowning deaths can be attributed to being submerged in a car and about 400 North Americans die from being submerged in a car every year. Rule 1. Don’t Call 911 until you’re out of the car. You’re going to need every second to get out of that vehicle. 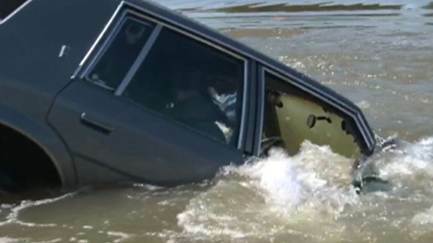 Worry about calling 911 once you’ve made it out alive, or, as in the case of the I-5 collapse in Washington state last year this saved lives, if your vehicle isn’t submerged. Time is critical, If you touch your cell phone you’re probably going to die. Rule 3. Don’t open the door! Roll down the windows instead. Opening the door is very difficult against the water pressure and it also allows so much water into the vehicle that it will speed up the sinking process. You’ll have 30 seconds to a minute until the water rises to the bottom of the passenger windows. This is what called the floating period. After that, the water pressure will force the window against the doorframe, making it essentially impossible to roll down. Caveat to Rule 3: Break that window. Since most vehicles these days have electronically controlled windows, the circuits probably will short before you have a chance to roll them down. In that case, you’ll need a tool to break the window open. Two of the most popular are the LifeHammer ($14.95), which has a hardened-steel point to help crack open the window, and the ResQMe keychain ($9.95), which uses a spring-loaded mechanism to shatter glass. If you plan on practicing with either one of these, take it from personal experience and wear work gloves. Otherwise you will cut your hands. Make sure these tools are within reach at all times, otherwise you’ll never get to them in time And they won’t work underwater. Again, you’ve got act quickly. Rule 4. Children first. Everybody should go out their own window if possible, but the kids are going to have a harder time fighting through the rush of water, so push them out if you have to. Starting with the oldest kids and taking the youngest out in your arms. If you’ve failed to get that window rolled down or broken, you’ll still have the slightest of chances to escape. 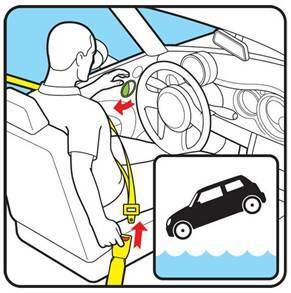 Once water fills the car, the pressure will be equalized and you will be able to open the door. But to do this, you will also have to be expert at holding your breath in an extremely stressful situation. that unless you’re a modern-day Houdini, the odds are pretty slim. Your clothing and heavy objects in your pockets can make you sink. Be mentally prepared to kick off your shoes and remove heavy outer clothing such as jackets if necessary. The less clothing you have on the easier swimming will be. Even your jeans or pants will weigh you down significantly. You can also use the metal part of the head rest to break the windows. Don’t bother turning your lights off. Turn them on if you are unable to escape or if the water is cloudy. The light’s electronics are usually waterproofed, and the lights themselves will help rescuers find your vehicle. It can be difficult to direct other people in this situation. Be prepared and discuss the possibility before it happens. Focus on children first; adults will need to fend for themselves until the children have been helped, so don’t be distracted. Keep the tools for escaping within the vehicle at all times. The emergency window breaking devices are available from safety stores. Under certain circumstances pressure may not equalize until the entire cabin is flooded. 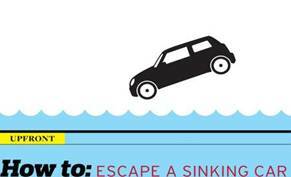 In this situation, either fight the current or wait until the car is fully submerged before making your escape. 3. Dont leave valuables in plain view. Items left in the open attract thieves. 4. Dont leave important documents such as bank statements, credit card bills/statements or other personal information in your vehicle. Thieves can use this information to steal your identity and access your bank and credit card accounts. 5. Never leave the registration or title in your car. If stolen, this makes it easier for the thief to dispose of your vehicle. Keep it with your drivers license or on your person. 12. Dont become complacent because you drive an older vehicle. Parts from older vehicles are in great demand. In older vehicles, replace T-shaped door locks with straight locks. 18. Ignition kill switches halt the fuel supply. 25. Audio alarms emit loud warning sounds when the doors, hood or trunk are opened. 26. Vehicle tracking systems, which are installed in your vehicle, are activated when your vehicle is stolen. These systems alert the police to the location of your vehicle for quick recovery. 27. Be suspicious of any deal that seems too good to be true. 28. When buying from a private individual, make sure the title and registration match the name and address of the person selling the vehicle. 29. Be cautious of a seller with no fixed address, place of employment, phone number or who only has a mobile phone or pager number. 30. Beware of a loose dashboard. It may indicate the VIN plate was replaced. 31. Thieves may remove the VIN plate and replace it with one from a similar wrecked vehicle. Be sure the VIN plate on the vehicles dash is present, secure and has no loose rivets. If the VIN plate is scratched or bent, tampering may have occurred. All 1970 and newer autos produced in North America have stainless steel rosette rivets with six petals and a hole in the middle. They are difficult to scratch with a knife. If in doubt about plate authenticity, check with a law enforcement agency. 32. The VIN on the dash must match the VIN on the registration, title and federal safety inspection sticker on the drivers door. 33. Make sure the federal safety inspection sticker located on the door or door jam is securely in place and none of the numbers appear to have been tampered with. 34. Check the engine identification number with the VIN and the federal safety inspection number on the driver door to ensure a match. 35. An excessively loose ignition switch may indicate tampering. Check the switch for chisel or pull marks. 36. Be wary of fresh paint on a newer vehicle. This may indicate an attempt to change the vehicles identity. 37. Check the inspection and license plate stickers to be sure they are current and issued by the same state. 38. Titles, especially from other states, and many registrations cards can be altered or counterfeited. Therefore, demand the title and registration card before paying and look them over carefully for apparent alterations. Also, make sure the title matches the registration. indicate the car was stolen in another state and fraudulently titled. 40. As you approach your vehicle be alert, have a plan of action and have your keys in your hands. Check around, under and in your vehicle for suspicious individuals. Immediately leave the scene if you have any suspicions. 41. If confronted, avoid verbal/physical confrontation — do exactly as you are told. If at all possible, never leave in the car with the carjacker. 42. Remember, you are more important than your vehicle, purse, wallet or any other valuables. Give them up and get out of harms way. 43. Once the thief leaves, immediately contact law enforcement. Be ready to provide a complete description of your vehicle, license plate and the suspects. 44. Once in your vehicle, lock your doors and keep the windows up while driving. 45. Leave room to maneuver around other vehicles when coming to a stop and be wary of people asking for directions or handing out fliers. 46. If bumped from behind and it seems suspicious, call the police from your car or move at a slow speed to a well lit, well populated area and immediately call the police. 47. Park in a well lit area or park with a group of other motorcycles. 48. Lock motorcycles together using a quality lock and chain or secure bikes to an immovable object when possible. Use a dual-lock system — a fork lock and a wheel lock. 49. Keep your vehicle registration and insurance information on your person. Secure your valuables. Dont leave jackets, helmets or any other valuables on your motorcycle. 50. Check on your motorcycle periodically. The best way to find out is to monitor your accounts and bank statements each month, and check your credit report on a regular basis. 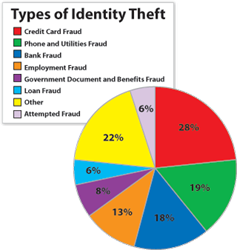 If you check your credit report regularly, you may be able to limit the damage caused by identity theft. Unfortunately, many consumers learn that their identity has been stolen after some damage has been done. · You may find out when bill collection agencies contact you for overdue debts you never incurred. · You may find out when you apply for a mortgage or car loan and learn that problems with your credit history are holding up the loan. · You may find out when you get something in the mail about an apartment you never rented, a house you never bought, or a job you never held. Contact the FTC, place a alert on your credit reports, and review your credit reports. Make it more difficult for thieves to take your personal property and identity. 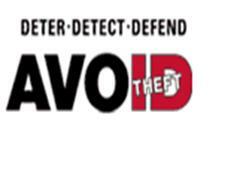 A great deal of Identity Theft prevention is Awareness it is an effective weapon against many forms identity theft. Be aware of how information is stolen and what you can do to protect yours, monitor your personal information to uncover any problems quickly, and know what to do when you suspect your identity has been stolen. Safety first, Safety Always! Thanks to parts Geek for going above and beyond the simple sales of automotive parts for doing the research and taking the time to provide its’ customers with this extremely valuable information.